Fill in the form below to subscribe to Woman's Day for up to 82% OFF what others pay on the newsstand — that's like getting 25 FREE issues! 30 issues for just $16 – SAVE 82% — Best Deal! 15 issues for just $10 – SAVE 78%! Sales tax will be charged where applicable. Each magazine subscription ordered is charged separately. When you order from different publishers, you will receive separate charges on your credit card statement or separate paper bills in the mail. 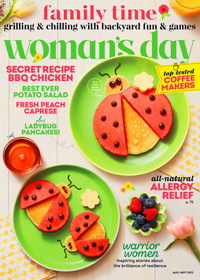 Woman's Day US cover price $2.99 per issue. Woman's Day is published 10 times a year. ELLE DECOR US cover price $5.99 per issue. ELLE DECOR is published 10 times a year.